[tweetmeme] We were on the road, headed out of town. The sky was clear and the air was warm. All around us the scenery was green. I could feel the energy building up inside, and energy that had seemed, for the most part, dormant all winter. I had planned on going fishing, but instead, a friend and on were going gold panning. Just in case, though, I brought my fly rod along anyway. 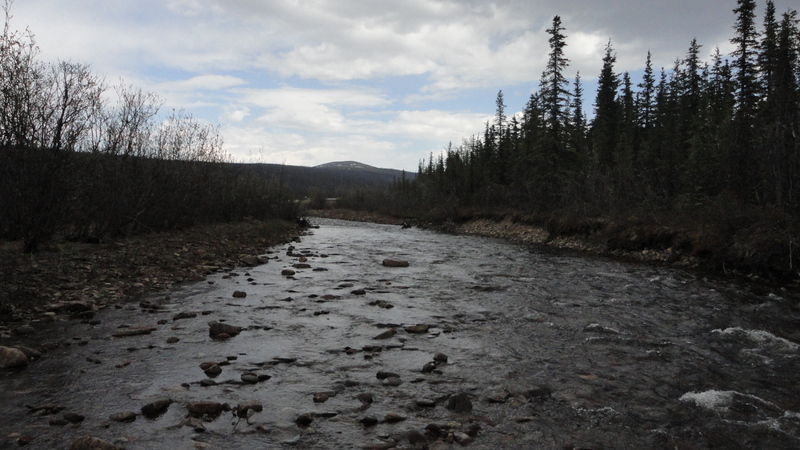 As we drove towards Nome Creek, I realized something about myself. Long periods of being shut inside is not good for anyone, but especially me. It makes me feel tired, and eventually leads to a depressed feeling, no matter how subtle that depression may be. But when I get outside, I feel a freshness blown into my lungs, I start to become alive again. Being outside, both outside my house and outside of town where it is more quiet—free from the noise of the city, where the air is cleaner—free from the smog and refineries, clears the mind. It becomes easier to think, to listen. Being outside refreshes the soul. Man was meant to live in the outdoors. Stephen, you still live in Alaska right. Are those pics from Alaska? I recently have gotten interested in Alaska. I bet the air is really fresh there–if you get out in the country. Do you see many bears? Sunsets? To answer your questions, I do still live here in Alaska, and my pics are from Alaska–north east of a ways from Fairbanks. Recently there’s been a lot of smoke, so fresh air is on a hiatus I guess. But it’s hard to beat living up here. The sunsets are now almost the same time as the sunrises. The bears are out there, but I haven’t seen any… yet. And my novel took a sabbatical while I attempted to pursue a new career path, but I’m working on getting back to it and hopefully finishing it up. If your interested in Alaska and want the best picture of what it is like–the culture and all–I recommend the book “Coming Into the Country” by John McPhee.